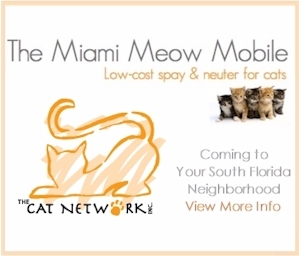 The Cat Network would like to recognize the following pet rescue and cat resource organizations that are helping cats in South Florida and around the country. Rally to Rescue® is a partnership of the ProPlan® brand and pet rescue organizations across the country dedicated to increasing awareness of pet rescue. Partner rescue organizations will be Ambassadors for the program. Alley Cat Allies: The national feral cat network, a non-profit organization promoting non-lethal control for feral cat colonies and humane methods to reduce the population of feral cats. GoodShop: When you shop at thousands of stores through Goodshop.com, The Cat Network will receive up to 20% of your purchase, at no cost to you! Goodshop works with thousands of stores to bring you great deals while donating to us! So use Goodshop to enjoy a coupon for PetSmart, get treats from your furry pet from PETCO, or purchase goods from Amazon. You can save money while supporting us. We appreciate it! HEALTHLABS provides pet allergy testing. We know that there are options available for people looking to adopt who have allergies, like adopting female animals or neutered males because they have less active sebaceous glands that create protein allergens, or adopting smaller pets (like cats) since they create smaller volumes of allergens, or that time and exposure can help lessen many reactions to allergies. Healthy Pet is dedicated to providing customers with the high quality pet supplies at low prices. A portion of each purchase made here will be donated to The Cat Network. Spay/Neuter Resources Low Cost or Free Spay – Neuter Programs in the United States. The Pets 911 mission of ensuring a better future for our pets started with a goal of a nation of no more homeless pets. Best Friends is working with you and with humane groups all across the country to bring about a time when homeless, unwanted animals are no longer being destroyed in shelters, and when every healthy dog or cat can be guaranteed a good life in a caring home. Best Friends works with our members — and with humane groups, individuals and entire communities — to set up spay/neuter, shelter, foster and adoption programs in neighborhoods, cities, and states throughout the country. Visit The Cat Network page for more information. Adopt A Pet (formerly 1-800-Save-A-Pet.com). We are North America’s largest non-profit pet adoption website and list 100,000 pets across 6,000 shelters all over the U.S. and Canada. The Florida Pet Book is more than just a Pet Magazine. It is a concerted effort to create a publication that offers useful and informative articles to pet owners. Florida Pet Book takes a fresh approach to the pet magazine, it’s not just another pet directory and we strive to make sure our circulation is extensive. 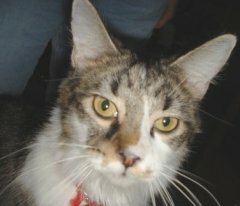 QuitDay.org has a great guide on smoking’s impact on pets and how pets and families can be healthier without cigarettes. The American Lung Association also supports QuitDay’s cause.